Darkness. The ak ak, ak ak ak of some night time insects. One goes off, another answers. No traffic. An eerie glow of the light near the shower block. When I crawl out of my tent and walk towards it, I notice the moon is also exposing everything. The buildings, the slippery slide and swings. I stop. Look up. Pray mosquitos don’t attack my bare legs while I’m gawping here. All the stars are wrong. My brain spins wildly looking for a rail to hang onto, something familiar and solid in the night sky. The absence of the Southern Cross throws me completely and I can’t really focus on one constellation. I just don’t know what any of them are without my giant southern icon in the sky. Its absence makes me homesick. But it doesn’t stop me staring, searching for a glimmer of recognition. These stars are bright. And there. Can’t say I ever really look up at the night sky in New York. Too busy looking for cash on the sidewalk and trying not to make eye contact with the crazies. The light pollution pretty much wrecks it anyway. Back in my tent and the ak aks invade my ears again. I record a quick voice note, then ak ak ak zzzzzz. I shall dream of nothing – I can’t remember having one dream since I started this thing – but if I do, I’m hoping it will be of pie. Pie still sits gloating in my belly as I lie here drifting off. Flip the chest door of this country open, you’ll find a golden piece of pie glowing there. Pie makes America magical. Pie makes America loved. Pie is what brought me here tonight. Breakfast in Marshfield has no pie. The Holiday Inn minion is so slow at putting out the hot breakfast items that all I get is cereal. Which is sad, because one way I justify getting hotels is thinking of the money I save on buying breakfast. No such luck here. Shoving an extra milky bowlful of cereal into my pie hole that has no pie, I glare at him. It’s 6.30 in the morning for pie’s sake, what’s he doing? Chomp. Scowl. Then he disappears again. I see a supervisor come in, examine the empty hot food area, check the time and mumble something to herself as she marks a little note on her checklist. Dude’s gonna get paddled by that lady. And what for? Not putting out the reheated, rubberized sausage and congealed fake eggs? I’m better off not eating that anyway. Not when there’s pie in my future. The goal is Golden City, Missouri. It’s rare to read any TransAmerica account and not hear about the pie in Golden City. As I wheel off into the morning, I half expect to see a giant glowing sphere of meringue on the horizon in the direction I’m headed. A pie beacon. But nothing is there. Just miles to cover and another Ozark up-down, self-propelled-rollercoaster day. Across the interstate at 7:15am and down onto a semi-busy road. Relax. I love mornings like this that give me a little ramp-up time. Not those ‘just straight into it, let’s see if you survive’ mornings. Waking up by slight degrees just as the day does. Legs tingling into a rhythm. Breathing steady. Just basking in the sun coming up. Listening to the sounds. I must remember this forever. I must. Insects in the grass, chatting for no reason. Frogs, crickets, bird warbles. The sounds of the day broken only by the melodious tones of a dog ambush. Ah, another glorious day, another glorious pooch yell-fest. The hills are steep and stabby, but mercifully short for the most part. My brain is still confused, but I won’t allow it to think the word easy. For once that is planted, hard comes along to wreck the tea party and I don’t want that. When I really think about it, it’s not easy at all. But the short, sharp climbs happen with such regularity that I have no time to focus on the horror of any one in particular. I don’t get to the top and think “I will remember that one for the rest of my puny life”. A realization: I feel physically good today. Like my legs are in for a bit of tough love but completely up to the challenge. It’s a muscle day. Up muscle, down crank, up muscle. A heavy lifting, gritting teeth day. The burn. The pain. It all gets thrown on my determination fire and I seem to be finding joy in the suffering of gutting it out to get to the top. A flying run-up, get half way, then down to my middle ring, then down to small, stand up and grind. Sharp and tight turns of the cranks. Sit down and finish it off. Quick reprieve then rinse. Repeat. Two days ago, I would’ve given up on that hill. It’s a thought I have many times. Almost 30 miles in 2.5 hours. Been a while since I’ve seen those kinds of numbers. Glancing down at the Garmin I note my average speed is up. As it ticks up, so does my happiness. At a gas station in Everton, I call the number of a bike hostel I’d read about. The girl tells me she has no idea what I’m talking about and we part on ‘bad number’ terms. Strange. I decide I’ll call when I get closer to Golden City, then buy a packet of beef jerky to gnaw on. There is no real food in this gas station. Not much else to do but buy something packaged that I know won’t kill me. Carry on. Into the day’s belly. I am swallowed whole. I don’t moo at the Friesian cows as I go past, but I admire how their black and white cookie-ness sets them off against the green rolling pastures. They just stand there and watch, chewing. Thoughtful. Bored. There’s still no shoulder, so I’m very conscious of sticking close to the edge of the road as cars and trucks barrel by. Keep my ears swiveled for the familiar sound of revving engines breaking up the peaceful sounds of farm life. It serves me well. Not everything is perfect. It’s hot. Arm coolers are effective only if you can keep them constantly damp, and the heat makes these effective for all of 10 minutes at a time. Less if you’re climbing. Then they just dry out and become very snug sunscreen. Still, I don’t roll them down. Every so often, I just stop and squeeze some more water on them. It’s enough to keep me going and I’m not worried about running out of water today. For once, I’m not worried. One walk. There’s always one. A massively long downhill and I fly fly fly. But then a massively long climb and I just don’t have the legs for it. Make it three quarters of the way before I decide I might as well just walk it up. Give my legs a stretch. As each car approaches from behind, I stop, hug the road edge, and make eye contact to make sure they have registered I’m there. Most give me a wide berth. For once, I am not discouraged by this walk. At the top, I feel kind of elated actually. Not far to go. And that means just one thing. Before long, I make the final turn and hit the straight road that will take me to Golden City. I know it’s close, the water tower in the distance tells me so. It takes a while to get there, but I’m feeling good. It’s still early afternoon and the day has rolled out perfectly. A balanced mix of difficult and manageable. The main street seems very low key. Subdued. But I see the sign for Cooky’s Cafe and my brain fills with three simple letters. Checking the number I have scribbled down for the bike hostel, I call. At this point, I would like to say that if you have a business that is no longer functioning, you should remember to, oh, I dunno, take down your website advertising how awesome that business is. Because people write down numbers and take notice. Don’t just get on the phone and say “oh, we haven’t had that for years.” And before saying that, don’t say “I’m having trouble understanding your accent” because certain sensitive people are liable to cry. Not me. But some people. Trust. I have issues. I didn’t trust the Adventure Cycling maps. They didn’t list the bike hostel. And now I know there’s a good reason for that. It ain’t there. But, when all else fails, try the city park. I creep down the short drive to inspect. Swings dangle. A roundabout stands still and a slippery slide looks plastic. I’m in front of the shower structure and looking towards a pavilion. Plenty of room to put up my tent in there in a nice freestanding manner. But I’m feeling nervous. It is completely deserted. A city park in a strange town and here’s me, by myself. A decision is made. Rather than set up all my stuff and risk leaving it unattended, I will brave the spider-filled cement shower, get cleaned up, repack Zimmerman and the whole lot of us will head to Cooky’s. I emerge from the shower, plan half in motion, and begin repacking the bag when four girls ranging from maybe five to eight years old appear around a corner. One is carrying a small cat. The cat is not amused. They appear startled as they round the corner and stop dead in their tracks. These no-good girlos up to no good. Pure mischief rings their faces, and it doesn’t take them long to regain their composure. “Have you seen a little girl?” one asks, and I say no. I pack. They watch. And then watch longer. Fidgeting. Finally, they get bored of this strange, wet-haired person and wander off to create mischief with the playground equipment. I feel very good about taking all my stuff with me. Not that I think these girls would steal anything, but kids up to mischief do stupid things. These looked like girls who had a bit of the stupid in them. Down the street to Cooky’s. It’s about 5.30pm or so. Ignoring street etiquette, I park right in front on the pavement and remove my handlebar bag. Check Zimmerman’s position. The flag is at an awesome ‘over here, ma’ angle. Cleaned up, I now look like a regular person just out for a bite of pie. But they’re onto me at Cooky’s Cafe. Biker spotted. Sliding into a booth, the waitress brings over the bike book to sign and I flip through to read the witty, thankful ramblings and gushing praise held within. I won’t sign it yet. I HAVEN’T HAD THE PIE! This joint is jumpin’. Cheerleaders, families, high school kids. They’re all in here for dinner and after practice milkshakes. Conversation rings from one end of the room to the other. I feel rude for taking an entire booth, but what can I do? Ice water at one hand, sweet ice tea at the other, I listen as the special is rattled off. Pork chop with veggies. She has me at pork chop. Somehow she manages to interpret the dribbly sounds falling out the corner of my mouth as ‘I’ll have that’. I’m too nervous to even ask about the pie. It had eyed me most droolingly when I walked in. A whole glass case full to my left. Pies sitting proudly on their haunches, showing a bit of glaze, a hint of meringue. Glistening out the glass and hoping I’ll pick them. Giant, plentiful pies. Delighted apprehensive tension fills my belly. It’s ok, belly. I will replace that with pie very soon. But first, pork chop. Apple sauce. Corn. Mash. Fresh bread. I am in some kind of belly heaven. This plate stands no chance as I do what I haven’t done in a great many years: wipe the surface clean with the last piece of bread. Everything is gone. It is a complete massacre. I lift my eyes to the waitresses face like in a stupor. This angel will bring me pie. This angel will know what kind I should get. She thinks a bit more. After much deliberation, I go for the coconut. 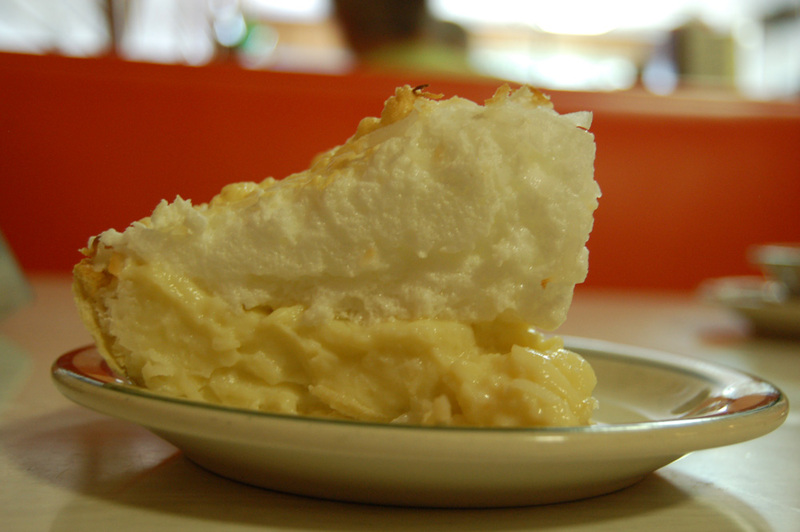 I’ve not really tried coconut pie before and when it turns up, my eyes turn to saucers. Two saucers covered with more pie. The meringue is fluffy on top. Light. Alluring. The coconut flecks are clearly visible in the filling. Tentatively, I break this perfect thing with my spoon and put that spoonful of coconut heaven into my mouth. Close lips. Withdraw spoon. It would be great to draw out each spoonful like that. To savor and flutter my eyelids and step fully into ecstasy land. But after that first taste, it takes me about two seconds to demolish that sucker. And then I’m left looking at an empty plate. “Did you enjoy it?” I look up at the waitress. She’s kind of smirking. I think. I’m grinning, probably with coconut in my teeth. This pie is very different in taste, but just as exquisite as the coconut. I take a little longer to devour it, but devour it I do. As I sit there and look at my assortment of empty plates, the wreckage of my dinner, I feel strangely pleased with myself. This is the biggest meal I’ve had so far on this trip. The first meal where I’ve consumed rather than pecked at. The first time I’ve felt truly hungry. Perhaps I’m finally getting the hang of this thing? But come on, stomach. Let’s get out of here. It’s only 6.30pm when I get back to the park and those pesky kids are still there. Putting on some kind of performance for each other and squealing like, well, little girls. Bag unpacked, I sit and stare at the mess of tent and sleeping bag and mat. I don’t like an audience. Don’t want to be watched as I fumble around with my gear. But I can’t wait forever, so fumble I do. A woman pops out of the yard of the house next to the park, off to walk her dogs. Over she comes. “Are you by yourself?” she asks, and we begin chatting. Her name is Alice. “I live there,” she says, pointing to a house. She then points out the houses either side, and tells me who lives in each one. And there it is again. That surprise in the heart at the kindness of strangers. A small act, greatly appreciated. “My mother will be very happy to hear of this,” I say. And she will. Later, as I’m settling into the tent and kicking my feet inside my sleeping bag to flap it out, I ponder the meaning of life. Is it to open yourself up to new things? To trust in people? To create a family? To build things? To work hard? To go out into the world and seek reality rather than live vicariously through others? 42? Or is it just savoring a great piece of pie? Pie days are what we live for as cyclists. Long day in the saddle, wind at you back the whole way, no mechanicals or dogs and that quaint back roads cafe with the delectable pie made by a 90 yr old retired lady. Pie Day. Sounds like a fantastic day. And as for life think I’ll go with Carney on this, definatly 42 and pie if the pie is as good as Cooky’s! Done in by a fine piece of writing. Thank you for your wonderful entry into your story..
You took me from a cranky, uptight,angry man and transported me to a wonderful place called Noodle-ville! I got completely lost in your quest for pie and your accomplishment of finishing two slices of pie! Thank you for the brief respite from the trials of this life..
Great! Now I am going to have to stop by Marie Callender’s and get coconut cream pie tomorrow. Or maybe banana cream. Or maybe both! Been awhile since I’ve thought about ol’ “42”. That and a towel and some pie will get you far, I think. Picked up on your journey again after TransAm 1.0. As many others have said, your writing is truly great. I thank you for your blog and sharing your experience. Things seemed to have changed so much since I did my TransAm in 1989, but maybe not. I still recognize the places, the names. Funny, I cannot help but read your pie-centric entry here and think of Elden Nelson. Hmmmm. Best of luck to you in your continued journey. Bike touring is work. Long ago, my high school physics teacher patiently explained that work = force * distance. Your legs are spinning to infinity. Your body is a machine, and machines like this need fuel. Bio-fuel–or maybe pie-ofuel. Your favorite biofuel is pie–mine has some ingredients in common. When I’m on a long tour, I crave ice cream and French fries (but potato chips will do.) They are universally available and come in a variety of flavors to stave off culinary fatigue. Sugar. Fat. Protein. Starch. Salt. Just what the body needs–and Haagen Das and Ben & Jerry’s have thoughtfully packaged their delicious product in little half-liter buckets which are perfect for cyclists. Keep your spoon in your pocket–I think you’ll be using it soon! I rode for pie this weekend too…….and cancer, but the pie was a big motivator after pulling an all-nighter at work. A fellow hiker, interesting chap from the Faroe Islands, had a certain philosophy about leaving his stuff in a tent. His idea was to scatter it about, so if someone was going to take something they were darn well going to have to dig through all the dirty socks and make a serious effort. Instead of lifting a neatly arranged backpack. Come to think of it, that’s pretty how much his tent naturally ordered itself to begin with, so it wasn’t like it was too much effort on his side. Awesome post! Great Blog and it sounds like a fantastic adventure! Awesome! Pie day is great! Are you coming to Seattle? If you are, I have 2 guest rooms and a guest bathroom for you to stay in…as long as you like animals [2 cats, a dog, and a rabbit]. My husband makes a mean steak and pretty good ribs. We would love to have you stay. If you going to Portland, we can meet you there and buy you dinner! I am South African and he is American and we are the laziest bikers under the sun, but we love to hear other peoples adventures. Anyhoo, we are super proud of you and watching your updates daily! Be safe out there. An observation from my cross-country ride; there is an inverse relationship between the size of the town and the friendliness of the people. Small town = friendly people. Of course, Your mileage may vary, void where prohibited, and/or where there is no pie. Meaning of life stuff………All is topped off by the goodness that is good pie! Janeen, here’s two easy ones to find in our night sky. Go find a Subaru and look at the logo in the grill. That’s actually the Plieades, aka 7 Sisters. Pretty easy to find in a clear sky as they’re all bunched up together. Just about as easy as the Southern Cross is Orion. Always pretty easy (as pie?) to spot his belt, which has three big stars right in a row. Then, depending on which direction you’re looking you can see his hands and feet reaching out. I saw Precious breaking 20 mph this morning and figured you must’ve been on one lovely downhill. hey you are a very good writer! Sorry usually I just copy and paste…;) miss you, be safe. I’m pretty late to your TransAm journey but enjoying it nonetheless (and no, I have no idea what none the less means). This entry has made really HUNGER for pie. We are currently in Sao Paulo Brazil from last August until this coming May. Countless times when we are out to dinner or walking the streets gazing into store windows I have one question: “Why is there no pie in Brazil?” Really. NO pie anywhere. But when I get home to Oregon…………Marionberry Pie Ice Cream!! Ride Long and Prosper….oh, you already did.